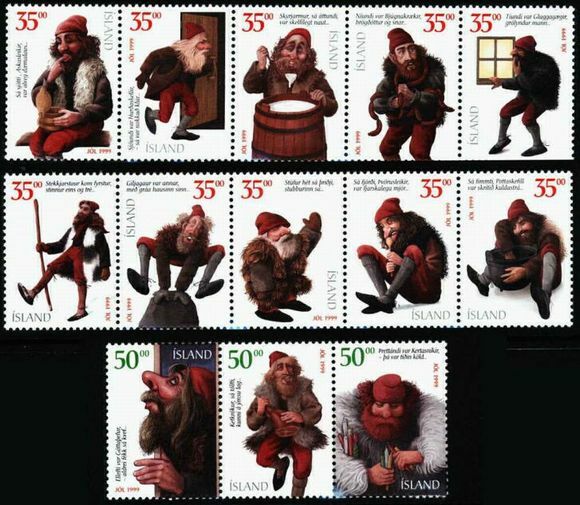 Icelandic Yute Goblins (lit: Yuletide lads) were first mentioned in written text in the 17th century. Initially they were more or less considered as giants or monsters, but in the 19th century public opinion towards them changed and gradually they have evolved from being creatures feared by children, to beings who are friendly with them. The Yule Goblins were variously counted as nine or thirteen. The latter number fits well with the Days of Christmas. Quotes from this verse are found on each stamp. It is noteworthy that this year marks the 100th year from the birth of Jóhannes úr Kötlum. He died in 1972. lceland Post has decided to release all 13 stamps together, instead of distributing them over several years.